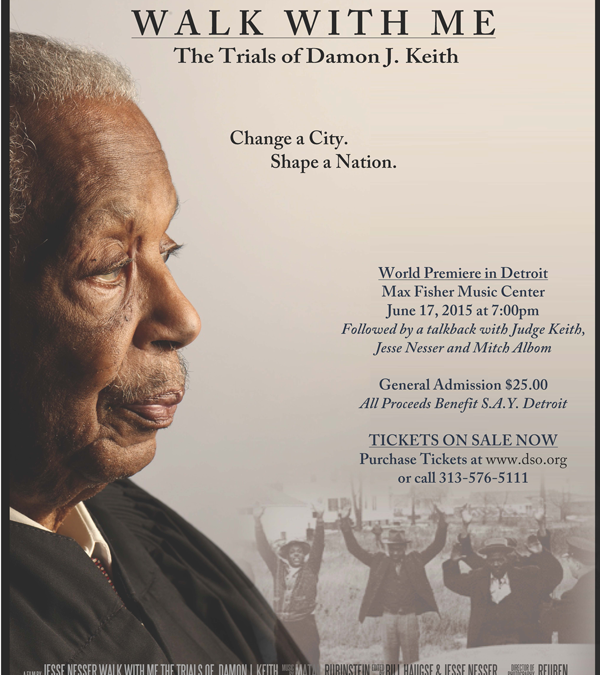 Walk With Me, the documentary about legendary federal judge and civil rights hero Damon Keith, will have its world premiere in Detroit at the Max Fisher Music Center on June 17. All ticket proceeds will benefit S.A.Y. Detroit. From director Jesse Nesser and executive producers Mitch Albom, Cynthia & Edsel Ford, Faye Nelson, and Frank Fountain, Walk With Me tells the story of ten extraordinary years, four unprecedented cases, and one unconventional federal Judge, who forever changed civil rights in the U.S. In the wake of the 1967 Detroit race riots, rookie African American Judge Damon J. Keith caused controversy by rooting out hidden discriminatory practices that had been woven into our housing, school, work, and police institutions. Believing that the law could and should be used to pursue social change and racial equality, Keith shook the nation as he challenged the status quo and faced off against angry crowds, the KKK, and even a sitting U.S. President.